Description: This sea anemone has a wide and firmly adherent base. The column is smooth, divided into scapus and capitulum, with a prominent parapet and fosse. The tentacles are slender, short or moderate and very numerous in large or medium sized specimens. Acontia are present but not readily emitted. Colour is usually white or orange, occasionally buff, yellow or reddish, sometimes bi-coloured. Tentacles usually with a white band near the base. Size up to 120mm across base and 300mm tall but many small forms (dwarf races) occur which rarely exceed 30-40mm across the base. 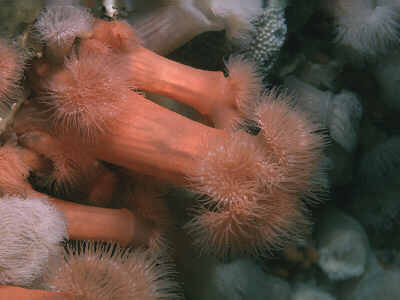 Habitat: Found attached to rocks, etc., from the middle shore to about 100m depth. Typically in places where there is strong water movement; often on projecting substrates such as piers, sewage pipes, wrecks, etc. Large specimens rarely occur on shore but may be abundant in the sublittoral. Small forms are frequent in brackish-water situations. Distribution: Common on all British coasts and northwest Atlantic generally, occasional in the Mediterranean. Similar Species: The familiar large 'plumose' form is easily recognised and well known. Smaller varieties may cause difficulty but providing the key characters are considered, no real problem in identification should arise. Reproduces by basal lacerations. Small specimens are frequently mis-identified as Sagartia spp. but this genus lacks a parapet and bears suckers on the column. Diadumene cincta and Haliplanella lineata possess a parapet and lack suckers but are easily distinguished by other features (see relevant descriptions). Smooth column with prominent, often collar-like parapet. Plain, unpatterned coloration with a whitish band usually present on each tentacle. Picton, B.E. & Morrow, C.C. (2016). Metridium senile (Linnaeus, 1761). [In] Encyclopedia of Marine Life of Britain and Ireland.